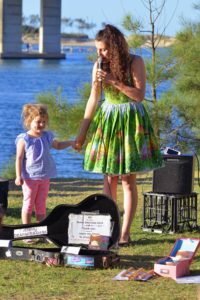 Officially confirmed as one of the best events in Australia, Gold Coast local festival Buskers by the Creek is set to deliver plenty of toe-tapping, family-friendly fun this weekend. Now in its fifth year, Buskers by the Creek is back to showcase the best singers, musicians and performers – but this year, there is an added Brazilian twist! Expect a tempo de festa carnivale vibe, with entertaining Brazilian acts, roaming dancers, sequins and the Brazilian bling the party nation is famous for. 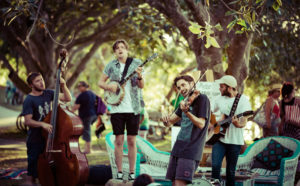 Held at the pristine waterfront location of Winders Park, Currumbin, the busking festival – the largest in Australia – will see more than 300 Australian and international buskers perform over two days, as well as a bevy of international food options, a dedicated bar area and Karma Kid’s zone. Catch the ‘Battle of the Buskers’ tonight at the Currumbin Pub before the festival officially kicks off on Saturday. Then, head creek-side for a weekend full of great music and inspiring performances, as buskers of all skill levels perform for the love of their craft. 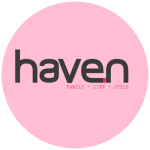 A proudly free, family and dog friendly festival, event goes are encouraged to bring a chair or picnic blanket and their spare change to soak up the eclectic atmosphere and unlimited entertainment the event provides. 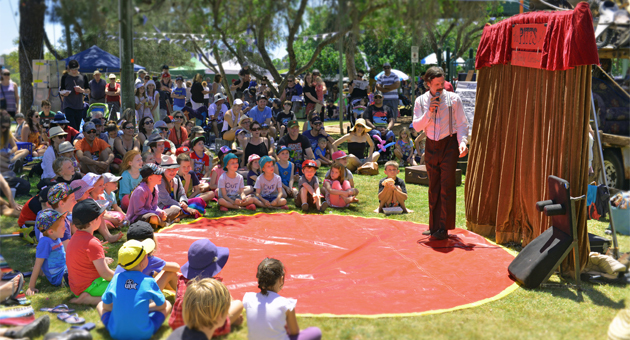 Children of all ages will be well accommodated in the dedicated Karma Kid’s Zone, which will provide age appropriate entertainment, circus acts to inspire and intrigue, arts and craft and more. And, in an event first, drinks will be flowing – and floating – at Bar Copacabana, the floating bar that isn’t just a first for the festival, but a Queensland first, too. Bar Copacabana will be Brazilian-inspired, in-line with the festival’s theme, and host Brazilian acts including DJ CVIO, DJ MAXX R, Brazo Duo, Flavio Correa, Rodrigo Ferraz, and Zambabem Trio. There will be plenty of on-shore drink options, too. To make the event accessible, plenty of parking options are available including the oval at Currumbin Primary School for a small fee. And, in another event first, $2 taxi fares per person will be provided by Gold Coast Cabs, enabling festival goers to catch a ride to and from the festival in one of the specially marked maxi taxis from one of the designated pick up locations at a heavily reduced price.